Here is the story of her ancestor. “This is the story of my four times grandmother, as we, her descendants know it. A lot of Australian histories focus on the male members of the family, and the hard working women who came with them, and bore numerable children, kept house in primitive conditions, farmed etc., who often don’t get the recognition they deserve. Why Maria ——- she stayed! Private William Nash left the colony and disappeared from our family history. Maria died in 1844, aged 74, so it is assumed she arrived aged 17 years with William Nash on board Prince of Wales. On arrival in the new settlement she was unmarried and pregnant, though she had travelled as his wife. Her son William was born 1 May 1788 and baptised in the new colony, his birth was the eighth listed, family history has him as the first child born of free settlers in the new settlement. Unfortunately he died June 1789. Maria and William were married “by license” February 1789, no. 57 in the register, by Reverend Richard Johnson. This fact is regarded as extraordinary as marriage “licenses” were only issued by Bishops and there were no Bishops in the settlement at this time so it seems the “licenses” came with them from England. It’s source has never been traced. In 1790 William and Maria Nash travelled to Norfolk Island on board the Sirius. The sea was too rough to land at Sydney Bay so the ship went around to Cascade Bay. There is no wharf there so, if she disembarked there, the process was hazardous. Into a row boat, which was brought into a large rock, and when the sea calms down a bit, you leap onto the rock between swells! Difficult enough in a pair of jeans, let alone in a long skirt, and likely pregnant again. The other option was to remain on the Sirius and come back to Sydney Bay. This time Sirius struck the reef and proceeded to break up and sink. It is commented on that the Sirius held together long enough to get the people off. Now with a loss of provisions and an increase in population of Norfolk Island, rations were reduced. The mutton bird became the staple food, imagine cooking and eating this day after day! Plus clothing was in short supply. Maria’s son John was born on Norfolk Island 1790/179, her first son being dead most likely 12 months. By this time conditions on the island were so bad the Marines were protesting, just short of mutiny, a pretty stressful time for this young wife. 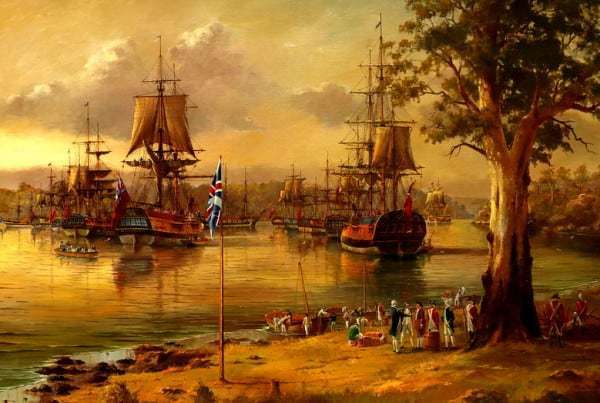 William and Maria returned to Sydney in 1791. Her subsequent children were Mary, born 1793, William 1795, George 1797 and Sarah 1798. William Nash left the Marines in1797 and had received land grants totalling 205 acres at Mulgrave, Hawkesbury. This land would have required hand clearing before it was cultivated. The weather conditions were documented as droughts and flooding rains. By 1802 Maria had left William and was living with ex-convict Robert Guy (horse theft), transported 1790 aboard Scarborough. On his pardon he was granted 30 acres at Concord, N.S.W; his family, listed in the Settlers Muster Book 1802 was “woman and two children”, George and Sarah. The two older children, Mary and William were employed elsewhere. By 1803 their farm was at Nepean and remained in the family for the next 60 years. William (jnr) died of snake bite in 1808. This case was between William and Robert Guy, Maria having no input into the case! Williams’ case was dismissed as he had not enacted on a previous decision made by the Judge Advocate. William Nash disappears from the family history in 1804? Returned to England? lost at sea with son John. Life was not uneventful for Maria. She had a short spell in gaol in 1808 for perjury—Robert Guy in trouble again over a horse, a mix-up over payment. Family lore has it that Robert Guy was a decent man, a successful farmer and a good step-father, he was witness at Mary’s wedding to Sergeant Robert Hall and Sarah named her son Robert after him.This boy being the eventual heir to his property. Robert Guy died in 1820, aged 48 and is buried at Castlereagh. Maria was his common-law wife and by the law of the day she was not entitled to any of his estate. By a will of 1819, Robert had left his property to Maria for her lifetime and then to go to his namesake Robert. They had never married as neither knew if previous spouses were dead or alive. Maria farmed this land till her death in1844. She is buried in an unmarked grave in the Church of England section of the Castlereagh cemetery. The Williams/Nash family erected a memorial plaque to her at Castlereagh in 2004. William Nash’s name appears on a monument to the pioneers of the Hawkesbury district even though he left the Colony . Lastly, ……our families pronounce her name MARIAH”. You can read more on Maria and William Nash under ‘Honouring 1914-1918’.